If you haven’t tried Field Roast products yet, where have you been?! Made of veggies, grains, and seasonings, you can’t go wrong, especially when you’re also getting 31 grams of protein per serving! This loaf has only 0.5 grams of saturated fat—real meat can never boast that. Anyhow, this came out delicious and came together in no time. We agreed that these would be perfect between buns with lettuce, tomato, and maybe even some avocado slices. Slice the Field Roast into about 8 slices. Combine the marinade ingredients in a large ziplock bag. Carefully place the slices into the bag. The slices may break in half if you’re not gentle when handling them. Lay the bag flat in the refrigerator, trying to lay out as may of the slices as possible. After 30 minutes, flip the bag over and marinate the other side for 30 minutes. Meanwhile, preheat the oven to 425 and peel and slice the potatoes into crescents—or however you’d like. Transfer to a large bowl and drizzle with olive oil; just enough to coat the potatoes. Sprinkle with salt, pepper, and cumin. Line a baking sheet with foil and lightly spray with cooking spray. 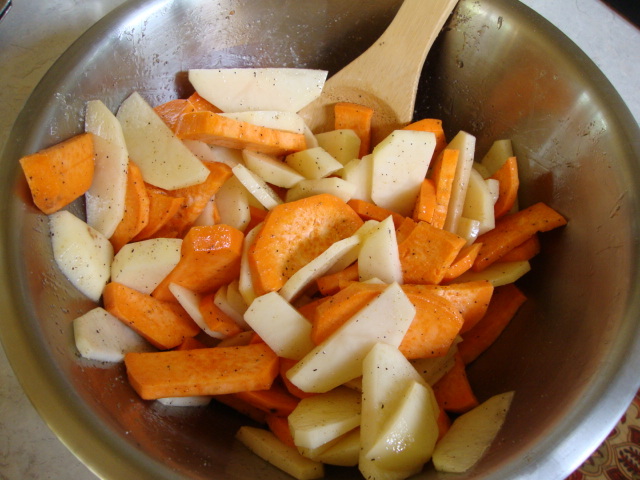 Lay the potatoes in a single layer onto the pan. Bake for 25-30 minutes. 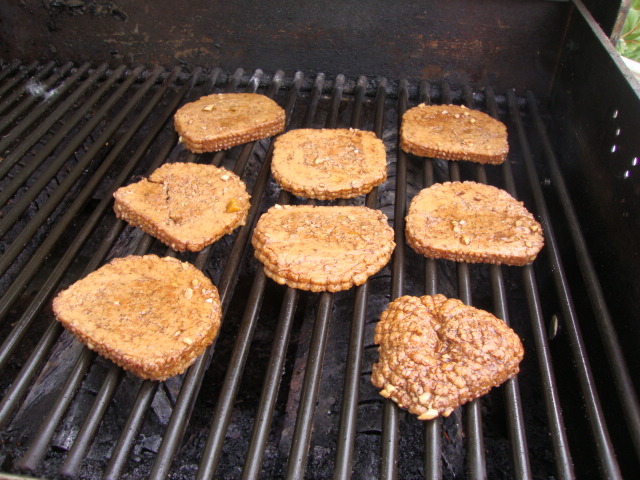 During the final 15 minutes of baking, heat the outdoor grill to a medium-high heat. 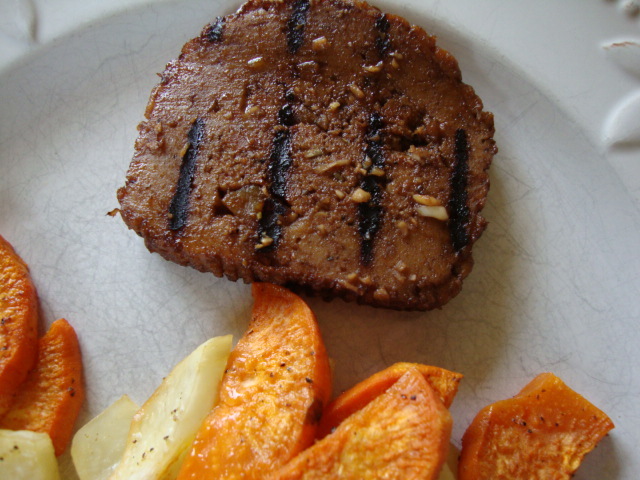 Place the marinated Field Roast slices on the grill and grill each side for 5-6 minutes. 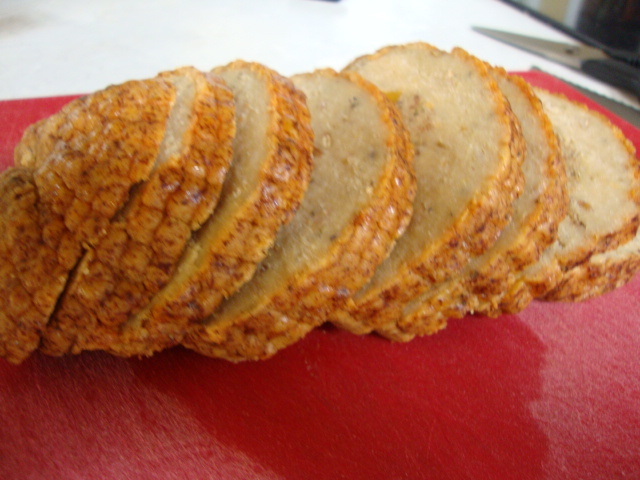 Serve the slices on their own, or as “hamburgers.” Enjoy! If you haven't tried Field Roast products yet, where have you been?! Made of veggies, grains, and seasonings, you can't go wrong, especially when you're also getting 31 grams of protein per serving! This loaf has only 0.5 grams of saturated fat---real meat can never boast that. Anyhow, this came out delicious and came together in no time. We agreed that these would be perfect between buns with lettuce, tomato, and maybe even some avocado slices. Combine the marinade ingredients in a large ziplock bag. Carefully place the slices into the bag. The slices may break in half if you're not gentle when handling them. Lay the bag flat in the refrigerator, trying to lay out as may of the slices as possible. After 30 minutes, flip the bag over and marinate the other side for 30 minutes. Meanwhile, preheat the oven to 425 and peel and slice the potatoes into crescents---or however you'd like. Transfer to a large bowl and drizzle with olive oil; just enough to coat the potatoes. Sprinkle with salt, pepper, and cumin. Serve the slices on their own, or as "hamburgers." Enjoy! Bummer–they’re great. Find Field Roast on Facebook and tell them that you’re having difficulty finding their products; they may be able to get something going in your area. You have a great site by the way–some delicious-looking recipes! 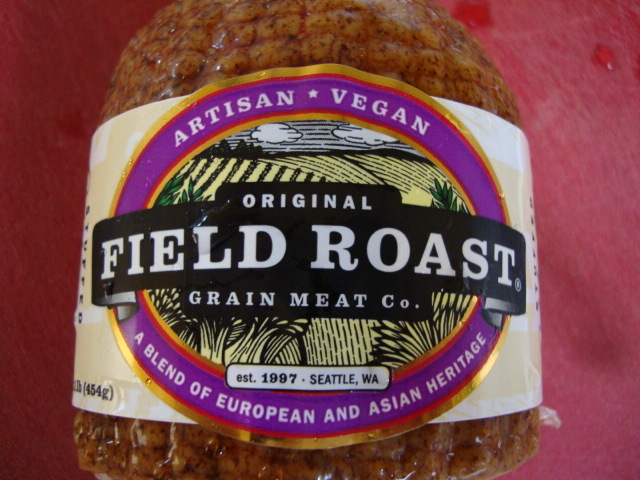 I really love field roast–it is the only “meat analogue” that I eat, and my vegetarian husband uses it for sandwiches. I haven’t tried a marinade though, so that will give it a new spin. Now I know what to pick up at the store tonight! I haven’t tried this before, but I’m sold. Thank you so much for sharing with me, my sweet friend. I hope you have a wonderful Tuesday. I’m starting out strong with an egg sandwich and a big cup of coffee 🙂 Much love from Austin!